Well this was unexpected. A new Beck album, for someone interested in album cover art like myself, is always cause for interest. After the graphic excess of his previous release ‘The Information’, with its’ DIY sticker set, what was in store for the next cover? Bet you weren’t thinking it was going to be a rip on Bob Dylan’s ‘Highway 61 Revisited’, can’t say I saw that coming. So what to make of this rather sombre presentation. Beck has always been about the subtle re-invention of himself and his music. He’s come a long way from the twenty something dude singing about being a ‘Loser’. With the truly creative artist it’s always about growth, in whatever medium they choose to work in. There comes a point (it’s usually a mid 30s thing) where the artist reaches a plateau in their output – creatively they’ve achieved much of what they set out to do – the audience has also come to expect a certain amount from the artist, where to from here then? The immediate reaction is usually a certain amount of reflection upon what has gone before, and what can be done to make it fresh and unexpected again. The first step is tearing done all those accumulated expectations – getting back to basics as it were, to build something up again. 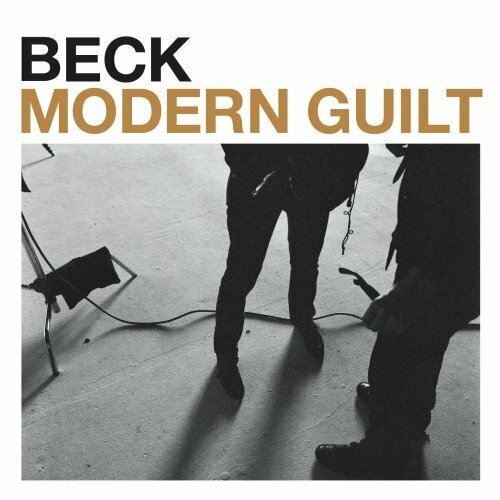 Looking at the cover for ‘Modern Guilt’ – it seems like Beck’s call to tear it all done and start anew (much like Dylan did with ‘Highway 61 Revisited’ – it all starts to come together now! The cover looks like a combination of a Reid Miles Bluenote album design from the 50s mixed with the ultra minimalism of a Tom Hingston designed ‘Spiritualized’ album. Musically, that’s probably not a bad analogy as well – the sounds are very back to basics, rootsy and mellow, but flourished with a typical dash of techno, drum & bass twiddling. Seen in that light, the cover works a treat, it’s seemingly ‘off-the-cuff’ design aesthetic actually being a lot more considered than you would think. It’s therefore a very interesting representation of an artist cutting back the extraneous, the expectations of years of releases, to find some footing for where his music will take him next.